I have noticed that the flight path data is not being displayed on my Aspen PFD/MFD . The flight plan route show correctly but the curved path course does not transfer from the IFD540 to the Aspen screen. I noticed that the HOLD depictions are also missing. The IFD540 shows the actual flight path for entry i.e. parallel, teardrop etc. on the screen but only the standard hold image is shown on the Aspen units. Anyone know why this data is not getting transferred? Is this a recent phenomenon, or did it just become noticed? Annual recently, or other equipment install since it started? Could be a stream or settings issue, but more information is required to troubleshoot. This condition was actually brought to my attention. I did not notice it so I can't say that it was a change or always this way. The IFD 540 is wired to the Aspens via 429 data lines per the install instruction. I thought what was shown on the Avidyne would be shown on the Aspen. Well, I have a pro 1500 system that is driven by my 540, on the MFD, which is the second Aspen system that is what I get, a repeat of the 540 stuff, on the primary I do not get that information. What Aspen system do you have? Is auto course enabled? You are at the fix, what is the next fix on your 540? I can only see the Aspen, do you have this shot with the 540 in view? My IFD540 shows the HOLD racetrack with the parallel entry path and the message at the bottom of the screen Parallel entry. We’ve had the exact same issue. Approaching KAHN from the south, we specified the RNAV20 with procedure turn at UMMIL. 540 showed proper route, Aspen PFD showed the CDI properly but the MFD did not update magenta line to proper path. If you look at the top of the MFD it shows that we are on an active segment to KAHN heading 359 degrees and then to UMMIL. But 359 degrees is the heading to UMMIL and KAHN is more like 280 when this photo was taken. These photos were several minutes after activating the approach. Telling it to go direct UMMIL several times didn’t change anything. Eventually I added UMMIL manually as a waypoint and that fixed it. That was last weekend. Yesterday I specified the ILS 27 and things updated immediately. Very puzzling. Any ideas? Getting close to my month in and considering putting the 530 back in and returning the 540 if this keeps up. looks like there was a gap in your flight plan. That might have something to do with it. The IFD map is drawn using every bit of information that the IFD has regarding the flight plan. The Aspen, however, is being driven by the ARINC 429 GAMA Graphics stream. The GAMA 429 stream doesn't have enough features or capacity to fully replicate what you'll see on the IFD. That's a function of the decades old spec, not the IFD. 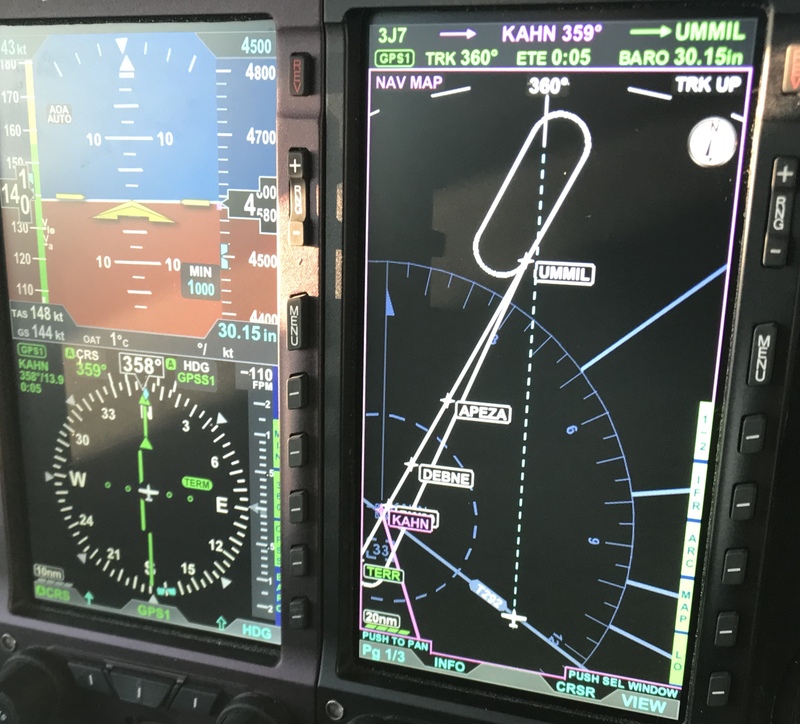 In the specific case you illustrated, the IFD will show a hold entry and the candy-stripe next leg, but the Aspen (or any other device using the GAMA Graphics) will only shown the basic hold. ... KAHN ... Very puzzling. Any ideas? I have noticed before that the Aspen is very slow to respond to changes in the ARINC-429 stream. I'm not sure exactly why that is. It actually appears to process some of the data quickly, but the active waypoint and the graphics are really slow. I did try your exact example using an Aspen PFD and it did ultimately update to UMMIL, but it was minutes before that happened. I was simultaneously running one of our Entegra MFDs and it responded to the same data stream almost immediately. It may have something to do with the preceding gap, as suggested. I'll try to run a few more informal tests here to see if I can do anything in the GAMA graphics stream to kick start the Aspen while not breaking any of the other devices that typically connect to that same stream. Thanks for the quick reply. Our experience is that sometimes it does update after several minutes, other times is simply doesn’t update. Still others it works normally. It was sometimes slow with the Garmin, but never more than 15-20 seconds. In the attached case, we let it go more than 10 mins with nothing. Most unsettling is that the Aspen did NOT behave this way with the Garmin 530w so we cant be blaming the Aspen. Either I screwed something up on the install or the 540 is doing something different and isn’t a perfect substitute for the Garmin. I’m about to send an email with a few more examples (and some other bugs/questions) to your support email address. Happy to email them directly to you as well if you would like. I'm not trying to shirk responsibility, but there is an aspect of the Aspen that could be in play here. I suspect they optimized their software for the Garmin stream and didn't necessarily strictly implement the GAMA 429 spec. So, anything in our stream that is not in the Garmin stream might not be handled so well. I believe that to be the case here since my best guess is that the cause of this behavior is the gap immediately preceding UMMIL. The 530 doesn't have the concept of gaps like the 540 does and gaps *are* represented in the GAMA stream. I did try a few quick software changes earlier today to see if I could kick-start the Aspen in this case, but to no avail. I'd have to break open a lot of stuff right now in order to do any more in depth testing and experimentation. I am curious, though, since there are plenty of users out there using Aspen. Is anyone else noticing this kind of behavior? If not, are other techniques being used for activating approaches that mask the behavior? Isn't it also fair to say that with the higher functionality of the IFD there is a lot more data being pumped out for the Aspen to process? Sort of like trying to run Windows 10 on an old PC. I wouldn't blame Windows 10 for the limitations of the hardware. I’m not trying to pick a fight with anyone or cast blame. Given I see mainly happy reports of IFD540 users and just this (original post and mine) and a few other mentions of issues with aspen MFDs on this forum and no where else, my assumption is that I must have screwed something up. There must be hundreds of installs with 540s and and Aspen MFDs so,if this was an ongoing problem, I’d think you would have heard about it. But, if I didn’t scree something up, it’s kind of a problem that the aspen will draw a line to the wrong place with the 540 in a way that didn’t happen with the Garmin 530 which it replaced. If I was in IMC when that happened it wouldn’t have been fun. Avidyne advertises this as a direct swap for the 530w. Maybe I’m being unreasonable here but that to me means it should just work with rather than break things that worked with the 530. I just went back and reviewed the self install checklist again and nowhere does it say I can’t do it if I also have other things the 530 was driving. I mean isn’t it a safety of flight issue to expect it to interface as the 530 did if it is meant to be a direct replacement? I also just found a compatibility list that does not include the Aspen MFD. If this is really a problem, and your testing seems to suggest it is, shouldn’t there be a limitation for self installs that one only has compatible equipment interfaces with the 530 and, thus, the 540? I have observed the same behaviour with the Aspen. While it would be nice if the response was faster, it has not bothered me a great deal. This may be something on which you wish to work with Aspen, since many IFD540 users have opted for the Aspen PFD. No offense taken, I truly am curious why we haven't heard about this before. We did plenty of testing with several pieces of equipment that consume the GAMA 429 stream, including Aspen, during development. We certainly noticed that the Aspen was slow to respond, but just never experienced a case that was as slow as this one. We'll be taking a look at this exact case to see what we can do to improve the performance. For anyone following this thread, I think I’ve narrowed the long delay issue down to an issue with procedures that have course reversals. See below for a lengthy email I sent to tech reps for both Avidyne and Aspen with links to videos showing how we came to this conclusion. Of note is that it’s not just the MFD. While the CDI on the PFD works, the next waypoint and heading into on the PFD are also not updated. Aspen has suggested switching the connection speeds to high speed. I tried that but it didn’t work at all (as in nothing worked) and besides it seems like a bad idea to just change settings in ways that are counter to the install manual. Aspen also seems to think paying them a few grand to upgrade to their new Max line will help. Sure. Why not. I’ve received no response from Avidyne. I’ve traded emails with both of you regarding an updating problem I’ve seen on my Aspen MFD since replacing my Garmin 530w with an Avidyne IFD540. I tried a few other scenarios this weekend that seems to isolate course reversals as the culprit. I’ve copied Mike with Gwinnett Aero and Jeff, my co-owner, on this email. You may recall we first saw this issue flying the RNAV 21 approach into KAHN via the UMMIL fix from the south. This procedure requires a course reversal from this direction. As shown in this video, you will see when going from “Direct KAHN” to selecting the approach, the IFD540 updates, the Aspen PFD 1000 updates with the proper heading and CDI guidance, but the MFD picture does not update. After a while we change the approach to use one of the feeder legs into the RNAV approach (specifically the same RNAV 20 but this time via THUDS, which does not require a course reversal). The Aspen updates the picture for this almost immediately. To make sure this issue wasn’t approach specific, we then selected the RNAV 27 via IMAVE (we were west of this fix thus requiring a course reversal). Again, the IFD updates right away but not the Aspen MFD. We select the exact same approach a little bit later but this time we are slightly east of (outside of) IMAVE making the course reversal optional. The Aspen MFD updates immediately showing the picture of the course reversal. In the next video we again specify RNAV 27 via IMAVE and we are west of (on the airport side) of the fix. This time it creates the image right away but doesn’t provide a magjeffenta line from the current position to IMAVE (though if you look close, the MFD does show the proper next waypoint on the top as IMAVE, which is not the case when the picture doesn’t update like in the prior videos). In the next video we select RNAV 27 via IMAVE again (we are inside the fix). The MFD does not update. However, if we delete the “gap” that shows up in the flight plan, the MFD updates the picture but seems to highlight the inbound leg to the airport rather than the course from our current location. In this next video, we are outside of IMAVE when we select the RNAV 27 approach via IMAVE. While the MFD updates the heading (at the top) to show IMAVE, the picture on the screen stays direct KAHN. We then remove the course reversal at IMAVE and the picture updates to what we’d expect to see. We then tried the RNAV 9 approach at KAHN via SALIN (which, from the east, requires a course reversal). Again, the MFD does not update. Deleting the course reversal allows the picture on the MFD to update. Next we try activating the same approach via one of the feeder legs (JODAS) and things update as we’d expect. At the very end of the video, we select the approach via SALIN again (around 3:30). At 4:54, the picture updates to show what we selected without any input by us – so it took 1:24 to draw the right picture). In the final video, we go back to the RNAV 20 via UMMIL. In this case we are north of the fix thus the course reversal/hold is not required. The image does not draw on the MFD. We then delete the hold and the picture updates immediately. Collectively, these examples seem to show that the problem is with approaches that have a course reversal aspect to them. Perhaps this can help uncover the underlying issue and maybe find a solution? If you would like me to try anything else, let me know. I have a similar issue with my single Aspen Pro 1000 that originates on the ground after power up with the flight plan loaded in the Avidyne IFD540(software V10.2.0) in that the Aspen lower CDI is very slow to populate the flight plan data. Yesterday, from power up until the flight plan displayed took 9.5 minutes. Seems to operate normally after 429 data is displayed on the CDI. 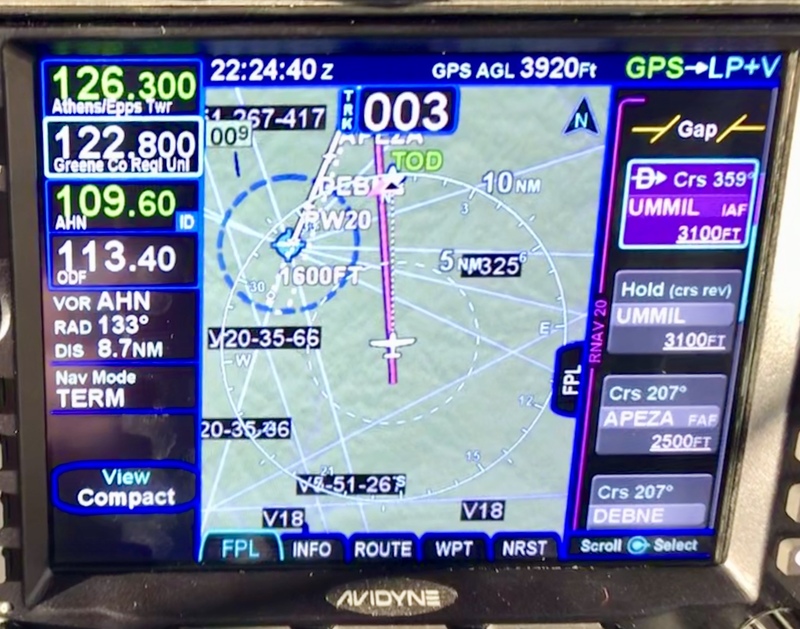 Over the last 6 mos or so I have noticed that my Aspen Pro 1000 p/n 910-00001-001, with software V2.7.2 has been very slow to populate the lower HSI with the flight plan data generated by my Avidyne IFD540 GPS. It takes 8-10 minutes after power up to finally accept the inputs and display the routing. Nothing has changed since the original install in April 2015 and has operated normally as soon as the GPS is fully operational. Is there currently any known issues on this anomaly/problem and or software upgrades that may alleviate this condition? This has something to do with how the IFD transmits there data via ARINC 429. The speed at which they are sending packets is faster than Garmin, Bendix/King, etc. and this is causing the delay in our processor computing the information when it is initially sent to us. It's possible that when our new Max is available, this will not be an issue since the Max has a much faster processor. We have not changed anything with our displays on how we receive information and there is no issue with this with all other GNAV's on the market. What is curious is there have been no changes to the hardware or software or settings in over 2 years and was not an issue before. I certainly will not be upgrading to the MAX unit in the future. I'm having this issue and it's a significant frustration while flying approaches. I can live with the update delay of the flight path display to the Aspen Pro (although it's painful). To be clear - everything is displaying fine on the Avidyne. However, it's a real problem to be hand-flying a hold on an approach that is displayed on the Avidyne and not displayed on the Aspen in front of me. This issue seems intermittent, but frequent enough to be a real problem. Is there any operator workaround to get it to display? I hate the idea of reloading an approach while flying it (and that doesn't work consistently). Suggestions? Get the FREE app with over 20,000 aviation events! Not to trivialize the issue but none of us should be dependent on these at a safety of flight level. on some level I agree. On the other hand, the whole point of spending the dollars on this equipment is to make things safer. If they are going to be certificated and priced as replacements for primary instruments, they should freaking work as expected. I'd prefer to focus on finding a solution, or at least an interim workaround. With all due respect, properly functioning navigation avionics during IFR flight are most definitely a safety of flight issue. Saying "Practice" isn't not a constructive contribution to the group on this topic searching for a solution so a very real and specific problem. Back on a constructive note: Has anyone identified if the issue is related to having a discontinuity in the flight plan? my suggestion to "Practice" was intended to be constructive. As I said, not to trivialize this issue. We are too dependent on our equipment and need to practice flying the airplane more. It is the SAFE thing to do. Now, I have seen delays of a few seconds with my Aspen/IFD540 combo but not minutes. Aspen says it might be improved with the new computer chips in the MAX upgrade. I will let you know when my upgrade is completed. We may have separate symptoms here. I would be more comfortable if my issue were related to a delay drawing the course and hold on the Aspen. In my case, many approaches fail to draw at all on the Aspen. I'm trying to characterize this problem a little better. We have an EFD1000 Aspen in our lab that exhibits really slow behavior and another that doesn't. The bad one has Map version 2.3.1 and IP version 2.0.2. The good one has Map version 2.6.2 and IOP version 2.0.5. Can you guys post the model/versions of your Aspens? I suspect that those of you having problems will be the most motivated to do so, but it would be interesting also to hear from those of you that aren't experiencing the problem as well. I was experiencing the issue with Aspen software version: MAP:V2.9 IOP:V2.1. I upgraded the Aspen today to MAP:V2.9.0.1 IOP:V2.1.1. A test flight with the unit after upgrade did not duplicate the issue (but it was slow to update FP display). It was not an exhaustive test flight, so I will send an update after more testing. I experience the slow Aspen update phenomenon with MAP v2.8 and IOP vB2.0.5. My Aspen Pro EFD 1000 is using Map Version 2.7.2 and IOP 2.0.5. Before departure for Sun N Fun on Thursday, it took about 12 minutes for the flight plan data populate to the Aspen. Before the data populated there was a GPS1(single GPS unit installed) yellow caution flag displayed with a red line through the caution flag. After the 12 minute period and just before the display populated, the Aspen showed the following: flashed about 3 times: RSM GPS Reversion, Emergency Use Only and then the Aspen displayed the flight plan data from the 540 with no problems for the remainder of the trip. The Aspen pilot guide states that this caution is presented when a configured GPS source's data is invalid or unavailable. I spoke with an Avidyne Tech Support Rep at the show and he ask that I forward my data logs. He was unaware of this issue. The Aspen Tech Rep was also unaware of this issue and had no explanation after I explained the entire sequence of events. On return from Sun N Fun on Sunday, the Aspen displayed the flight plan data after only about 1 minute, much quicker than I have experienced lately. Hope this info helps narrow down the possible causes. Did the IFD 540 show any issues? I,e. failure to lock in GPS position, etc.? The 540 was completely lock on with great GPS signal reception. The flight plan was installed, activated and fully operational on the 540. There were no other indications of a system failure or warning flags on the Avidyne unit. My next plan is to download the data logs from the 540 and foward to Avidyne Tech support.